Men like to have shoes and boots that are appropriate for any occasion. From something that works well in the office to footwear that’s ideal for working out or going on a weekend camping trip, the right footwear makes a difference. Since many occasions call for something casual rather than dressy, it pays to know which brands are best and what features they should provide. Here are some suggestions that will help you always have the right casual shoes for any occasion. Simplicity is often important when it comes to choosing casual shoes for men. The shoes must have shells that are constructed using rugged materials. Leather and similar materials are especially good choices for footwear when the plan is to work in the yard or build something in the backyard workshop. They are also great for a man who likes to spend time hiking or camping in the woods. The right type of shell keeps the feet warm, looks great, and can be cleaned with relative ease. Having casual shoes to kick back in while out with friends or to run errands should also be part of the wardrobe. Many men are surprised to learn that the same brands that make their favorite dress shoes also have casual options to consider. 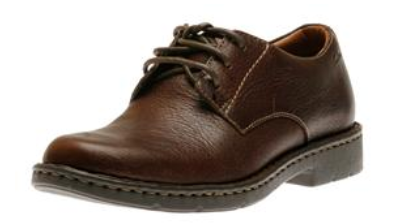 A prime example is Rockport Shoes for men. Along with selections that look great in the board room, Rockport also has designs that are ideal for running errands on weekends, going on a casual date, or to wear around the house. With these designs, you always have something that will work with your jeans or fit right in if you plan on heading out the door in a pair of Khakis. Staying fit is important for the body and the mind. The thing is that changing footwear for different activities is not always practical. One solution is to invest in shoes that work just fine for multiple forms of exercise. One option to consider is a pair of New Balance running shoes. They work fine if you want to take a long walk, spend some time in the gym, or go running. It’s easy to transition from one type of exercise to the next without breaking your stride long enough to put on a different pair of shoes. Whatever type of casual shoes you like to wear, they must provide a reasonable amount of comfort and support. The last thing you need is aching feet, ankles, and lower legs after you’ve been in the shoes for several hours. The ideal pair will provide plenty of cushioning, support your arches, and not chafe your instep. With the right level of support, you can forget about cramps in the lower legs or ankles that feel a little sore. Men like to invest in things that will last for a long time. That means spending a little more to purchase brands known to hold up well over time. Many men love the fact that Geox men’s shoes are built to last. They can be maintained with relative ease and provide years of reliable service. That more than justifies the initial cost. Remember that coming across a pair of casual shoes you love doesn’t just happen. It takes time and effort to find the right pair. Take a look at some of the designs offered today and compare the features. It won’t take long to find the casual shoes that you will enjoy for a long time. Over the past few years, more men than ever have realized that they are what they wear – and the footwear they choose is most certainly is no exception to this rule. Here are 4 styles and types of shoes that every man should ensure that he has in his collection, regardless of what line of work he may be in or how he enjoys spending most of his free time. Regardless of whether a man spends most of his time in an office that has a semi-formal dress code or he attends a lot of events that require the use of something smarter than sneakers, including a good quality pair (or two) of men’s Rockport shoes in the form of loafers into a wardrobe is a must. Nowadays, loafers are not only available in men’s Rockport shoe ranges in a variety of colors; men can choose whether they want plain loafers or those that have been embellished with tassels or buckles. Most men will be required to attend at least a few formal events in their lifetimes, and as a result, they should ensure that they own at least one pair of Mephisto men’s shoes in a black leather finish. When teamed with a suit, these shoes will ensure that they look their best at the next wedding or other formal events such as work functions, and dinner evenings. Nowadays, there are many black leather dress shoe options available at affordable prices. MBT shoes for men have become extremely popular over the past few years and many style options are available. 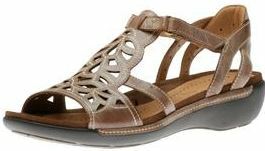 These range from sneaker-type shoes to sandals with raised or stacked soles and slip-ons in various colors and the padded and raised soles make wearing these shoes extremely comfortable. Smarter designs in this range are available in suede and shiny finishes, meaning that there is sure to be something to wear with even the smartest gray or black suit. Over the years, the range of Timberland shoes has grown from consisting of mostly outdoor boots to incorporate open sandals, flip flops and loafers as well. However, no men’s footwear collection can be considered as being complete unless at least one pair of Timberland boots is included. Many of the styles in the Timberland range ore waterproof as well as comfortable, and they are known to last for many years, making them one of the best footwear investments ever. When it comes to deciding which men’s Rockport shoes or other shoe brands to purchase, the above mentioned options are a mere sampling of what we have on offer. However, these are some of the best and most fashionable brands and styles that are currently available. This means that any man who owns and wears them will not only be in fashion; he will be able to wear any of these shoe styles with absolute pride whenever he sets foot out of the house. When wearing jeans, it’s important for men to ensure that they wear the right style shoes with them. Different cuts of jeans, for example, may require different shoe styles to be worn with them. Below are 5 examples of shoes that will look great with most pairs of men’s jeans. In most cases, you cannot go wrong when wearing a pair of sneakers with jeans, but with the array of colors and style options available nowadays, choosing the right pair can be challenging. However, many men have purchased sneakers from New Balance, such as the MO20BR and have reported that they are highly durable as well as attractive, meaning that they have been able to get many years’ use out of them. Available in dark brown with black trims, this shoe is sure to match most pairs of jeans. If you’re looking for something a little more casual than regular sneakers, but that still looks relatively smart when worn with jeans, you won’t go wrong with the Rockport PTG slip on shoe. Available in a great shade of navy with white trim around its sole, these shoes slip on and off extremely easily, making them a good choice for anyone who doesn’t enjoy having to fuss with shoelaces when getting ready to go out. These are extremely well-made and offer plenty ventilation to keep feet cool for extended periods. When an occasion or event calls for something a little smarter than basic sneakers or slip-ons, boat shoes can be a great choice, especially in navy blue. Timberland is known for providing nothing but the best quality and most comfortable shoes for men, and the Icon S O Boat is no exception. These have been finely stitched all round and detailed with genuine leather trims round the top to ensure that they will look just right with a smarter pair of jeans. If you prefer something that is a little plainer than a regular boat shoe but that still has somewhat of a smart element to it, leather loafers can be the right option. While these may look somewhat similar to boat shoes, they are toned down a little in that they have less of a leather trim and the finish is more suede-based than shiny. The soles have also been color-coded to brown instead of white, and these shoes are also known for being extremely comfortable. Boots have long been a popular option for wearing with jeans because they not only look attractive; they provide an additional measure of comfort in that they fit snugly around the ankles. The Ecco Turn Lace Boot is available in a neutral brown and has been crafted from soft, breathable leather on the upper and a 100% waterproof GORE-TEX coating to ensure that your feet stay dry – no matter what the weather. These boots are shock absorbent and they provide excellent traction as well. Regardless of how high up your ranking in the white collar world of wheeling and dealing, there are always going to be times when you need to have some good casual shoes. Getting casual is part of the equation of any guy’s success…you know what they say about the time honored adage from 1659 sharing that “all work and no play makes Jack a dull boy.” Whether to slip on some easy footwear for a quick trip up to the store, a leisurely lunch with the wife or girlfriend or getting a cup of something at Starbucks, a good pair of casual shoes is a staple of the complete male wardrobe. Here are the top 5 reasons to choose men’s casual shoes. 1. You Always Need at Least One Pair of Casual Shoes–but Probably More: There are always going to be those members of high society whose trademark is to show up at the most high faulting society functions all smoothly clad in black tie apparel and casual shoes with no socks, but we won’t go there just now. Assuming your penchant for the appropriate is intact, you will choose casual shoes for the casual occasions in life, whatever they may be. Likewise, a good casual shoe is not to be confused with an athletic shoe. The two are actually polar opposites. Casual shoes are to be worn when you will be partaking of the casual life, and not in any sort of position that would require any great volume of exertion whatsoever. There is nothing casual about participating in any worthwhile sport. 2. It’s Actually Good to Look GQ Even on Your Days Off and When You’re Doing Nothing: In fact, it’s often when you are your least presentable that someone will drop by or you will run into an old friend or business associate. With some great men’s casual shoes on your feet, you’ll be ready for anything, and you’ll look like you are. 3. Because You Want to Treat Your Feet Well. Of all the clothing you depend upon, it’s always your shoes that take the most significant beating. This is why it’s critical to look for your casual shoes from among well-proven brands like Clarks, Dansko, Rockport and Birkenstock. Otherwise, you could be merely throwing away your money. Good quality men’s casual shoes will continue to look great, for significantly longer periods (years) than inferior quality copies. You depend on your feet, so treat them well. Quality shoes are comfortable shoes. 4. Because Casual Attire Just Does Not Pair Well With Dress Shoes. Your entire wardrobe may not include a single pair of jeans; however just by stashing your suit jacket and tie at the end of the day, your whole look changes, and casual shoes are what you need to wear, to convey that you know what you’re doing. 5. Because Believe it or Not, People Judge You by Your Shoes. That’s right: It’s really funny, but someone can have on the most ratty looking pants and tee, but if they are wearing top quality casual shoes, they can appear to be on top of things and successful. So, by choosing quality men’s casual shoes, you might be able to save big on the other items comprising your “casual collection” of clothing. Shoes make the man, and casual shoes make the man relax and enjoy a little R&R time. Average shoe size has changed drastically over the years. Dive into this infographic to learn how to measure your feet properly to keep your feet healthy! Shoe sizes have changed drastically over the years. For example, in the United States, women’s average shoe sizes have gone up in the last century. The average shoe size for Canadian women is 6.5. The average shoe size for Canadian men is 10. Societal changes aside, your feet grow as you age, even beyond puberty. Some people over the age of 40 can expect to gain half a shoe size every decade. Tendons, ligaments, muscles, and tissue naturally lose elasticity and buoyancy as you age, but your feet are unique as they take your body’s entire weight. Gravity causes your feet to swell. The front of your foot widens. Your arch flattens, causing your foot to grow longer. Fitting shoes are healthy shoes. Tape the paper to the floor. You’ll be tracing your foot to measure, so make sure the paper is on a hard, flat surface (i.e., not carpet). Sit down with your foot planted firmly on the piece of paper on the floor. Bend your leg slightly forward so that your shin is just in front of your ankle. Don’t wear your shoes, but do wear socks. Trace the outline of your foot, holding your pen or pencil upright, not at an angle. Keep the writing utensil snug against your foot. If you’re having trouble with this step, get help from a friend. Draw straight lines touching the outermost points at the sides, bottom, and top of your foot tracing. These lines mark the width and length of your foot. Measure the distance from the top line to the bottom line. Use the closest 16th mark. Write this number down. It measures your foot’s length and is the primary factor in determining your shoe size. Measure the distance between the two lines at the sides of your feet. This determines the width of your feet. Subtract about □(3/16) ths of an inch from the length and width to accommodate the small space between the outline and your actual foot. Use the sizing charts below to determine your proper foot size. Note: use the measurements from the larger foot. Shoe widths are available in sizes A, B, C, D, and E with A being the narrowest and E being the widest. For narrow widths, the more letters, the slimmer the shoe. For example, a AAA is narrower than a AA. If the shoe does not indicate a width, it is most likely average/medium. For wide widths, the more letters, the wider the shoe. For example, a EEE is wider than a EE. If a shoe feels tight or loose along the sides of your feet, ask for a shoe of different width within the same size. Don’t go down a shoe size to accommodate narrow feet, or go up a shoe size to accommodate wide feet. For sneakers and most athletic shoes, if the brand doesn’t have different widths, remember that you don’t have to wear a shoe of your gender. Men: Try women’s shoes if you have narrow feet. Women: Try men’s shoes if you have wider or larger feet. Enrich your mind and sole by reading these interesting shoe facts! The average woman wore a size 3.5-4 in the beginning of the 20th century. The average increased to 5.5 from the 40s to the 60s. In the 70s, the average size increased to 7.5. Today the average size is 8.5-9. That’s more than an entire size within the last 30 years. Typically, women start wearing heels around the age of 12 and stop wearing them around 63. The man with the world record’s largest feet are 1 foot and 3 inches or 38.1 cm long. The most expensive pair of shoes were the Ruby Slippers worn by Judy Garland in the Wizard of Oz. They sold for $660,000 U.S. dollars on June 2, 2000. There was no difference between a left and right shoe until the 19th century. All shoes were the same shape. Until the 18th century, there was no difference between mens and womens shoes. The styles were the same. Louis XIV was only 5 feet 5 inches tall, so he made high-heeled shoes for men popular… and required men to wear them. Henry VIII made a law that required shoes to be 6 inches wide because his feet were swollen from Gout and wanted everyone else’s shoes to look the same as his. Sneakers were invented by Keds in 1917. They were called sneakers because of the new invention of rubber soles that were quiet when you walked. People could “sneak” around in them without others hearing them. In the 17th century, the upper class would wear six-inch heels that would require them to have two servants on either side to hold them up. ADIPRENE by Addidas technology featured in many Rockport shoes that are on SALE!!! The Rockport Sale is on!! Save up to 50 percent on selected styles. The ADIPRENE® by Addidas technology is featured in many of the new Rockport styles for Fall/Winter 2012. The ADIPRENE® technology provides shock absorbent cushioning, and the ADIPRENE+® provides forefront support to maximize comfort all day long!! TRU WALK – features leather and suede uppers that are durable and easy to clean. The ADIPRENE+® by Addidas technology will provide forefoot support, while the ADIPRENE by Addidas will provide shock absorbent cushioning to protect the heel. This lightweight casual shoe features EVA cushioning that will reduce foot and leg fatigue, and the truWALK architecture allows heel to toe foot motion. The Rockport Zana is a supportive walking shoe that is machine washable. The Zana features the ADIPRENE technology, which will provide support and shock absorbency all day. The fabric lining will keep your cool and dry, and the lace up closure will give you a customized fit. The lightweight rubber outsole is shock absorbent and slip resistant on a variety of different surfaces. The Lianna Quilt is a beautiful dress shoe with a stylish buckle detail. The leather uppers are comfortable and easy to clean. The Lianna features the ADIPRENE® technology for shock absorbent cushioning, and increased support. For Men the Rockport Waldron Ledge is a casual slip-on that features soft leather uppers, which are durable and easy to clean. The Rockport Waldron features two elastic gores for an easy and comfortable fit. The textile lining will keep your feet cool and dry, and the durable rubber outsole is shock absorbent and slip resistant. The Rockport Northam boot features the Hydro-Shield technology, which will provide a waterproof barrier. Made with full grain leather uppers, and a padded tongue that will prevent blisters, the Northam is a great choice. The EVA outsole will provide excellent grip on a variety of different surfaces, and the latex kinetic insole will provide comfort and support all day. Get these great styles while they last at Walking On A Cloud!!! Warm up this winter, as new winter boots are arriving daily from Merrell, Ecco, Clarks and many others. The Women’s Frost Glove from Merrell is made with Fleece lining, which will provide warmth all day. The comfortable fabric uppers are durable and waterproof, keeping your feet dry and comfortable. The vibram outsole is slip resistant, which will allow you to walk securely, during those wet winter days. This beautiful boot is also available in Charcoal and Burgundy. 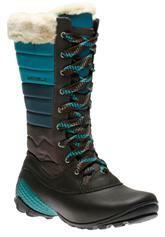 If you are looking for a boot that can handle extreme winter conditions, the Merrell Winter Belle is for you. The suede and nylon uppers are waterproof, and the lace-up closure is great for a customized fit. The fleece lining features 200 grams of Merrell Opti-Warm insulation, which will keep your feet warm in up to -15C. 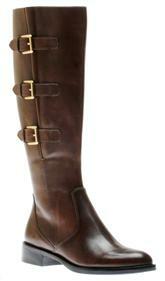 From Ecco the Hobart is an equestrian inspired boot that is made of beautiful and soft leather. The Ecco Hobart features a full length side zipper, while the three adjustable buckles will provide a secure fit on the shaft. The textile lining and leather sockliner will keep your feet cool and dry all day long. Do not worry about slipping on those cold wet surfaces, with the durable and slip resistant rubber outsole. For Men the Clarks Ruckus Maker is a comfortable walking boot. The laces will provide an adjustable and secure fit. The Ruckus Maker features soft leather uppers that are waterproof, while the OrthoLite footbed will provide comfort and support. Feel secure and safe while walking in the Rucks Maker, which features a slip resistant rubber outsole. The Clarks Quantock for Men is made of premium leather uppers. This fabulous product features GOR-TEX technology, which will provide durable waterproof protection. The padded molded insole will provide comfort all day, while the rubber outsole provides great traction and shock absorbency.